i heart peonies: Pemberley Events featured on Elizabeth Anne Designs! Pemberley Events featured on Elizabeth Anne Designs! We've actually been on Elizabeth Anne Designs twice in the past week (lucky us! ), but I'll get back to the earlier post soon. Our entry for the Indie Wed Inspired Creations Contest was featured yesterday and I am pretty darn excited. We haven't been able to share our official photos until now- I think to add a little drama for the contest. Here is a little peak. Head over to Elizabeth Anne Designs and let us know what you think. We'd love some comments. If you are interested, here is our full write-up on what inspired us/what we used to create Come Fly with Me! Our vignette was inspired by a photo of a fun-loving couple in a hot air balloon. From that idea, we branched out to a playful, organic feeling wedding vignette. Most of our display was vintage, with many items from either Viviana or Renee's shop. What wasn't vintage was handmade or inexpensively purchased. We started with a natural looking canopy/chuppah to “frame” our display. The chuppah was with PVC piping; the posts wrapped in ripped and lightly burned pieces of muslin. A ceiling of branches created the perfect organic structure to hang a multitude of lanterns and candles. We also created two papier mache hot air balloons to hang from the chuppah, flowers springing from their baskets. We chose a natural wood table and 6 mismatched chairs for our dinner party. We created a natural colored runner (to highlight the wood) with a variety of coordinating ribbons attached and muslin napkins to match. Pops of color came to the table in the glassware (translucent red and yellow hobnail), and patterned dishes. Saucers with a “come fly with me” cloud cup cake and a muslin favor bag added a little whimsy. We wrapped our flatware and napkin in a themed menu band. 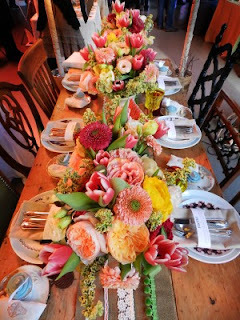 Three floral arrangements in vintage earthenware were displayed along the length of the table. The florals were seasonal, lush and natural in feel. We hung our balloon and a sky-themed backdrop along the back wall. The balloon and its basket were made from foam board, then papier mache'd a bit for texture and pai nted for color. Rachel set up a camera in front of the balloon so that we could host a photo booth. Guests really enjoyed taking their photo in a hot air balloon! They took advantage of a few props as well- chalkboard text bubbles, hats and fascinators. They received an email shortly after the event letting them know how they could download their photo. We also set up a small blue table with a vintage typewriter, seating chart, cake, a small floral arrangement and a few vintage books. We created the seating chart with a typewriter font and fed it into the typewriter. Behind the table, we hung a burlap map ("Where in the world are you sitting?") and attached small hot air balloons to show guests to their "continent." The main table included a small "Africa" sign to tie the two together. Our sweet, mint green cake with sugar anemones added a final, lovely touch to our display.